I love all the analysis going on about the tags in flickr and del.icio.us. Here's one article that's particularly interesting, about "folksonomies." I wonder . . . if more and more services in 2005 add user-generated tagging, will "federated tagging" be far behind? And if someone were to index all the tags from these various sites.... would the result be Taggle? Imagine: a service where you type in a keyword, and you get back all the hits that have that word as a tag. If Flickr, del.icio.us, and umpteen other sites cooperated, then an uber-tag-search service might just work . . . I must say that would be awesome--find a lot of media/info about a specific topic. 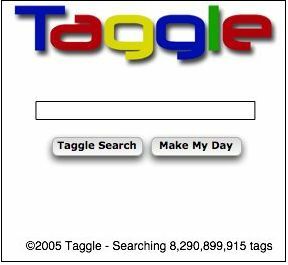 Here's a variation that I'd love to have: One browser based app that would be a "personal tag wrangler"(TM). I'd love to be able to browse my tags across Flickr, Gmail, Delicio.us, etc. So, I'd have my one list of tags and the tool would find me all my stuff that I tagged. 43Things.com is another new tag source to be added into the mix. The major problem I see with a tag search would be spam/cheating. People could just put a popular search term as a tag for whatever and boom, results. Couldn't the meta HTML tag be used for this, using the keywords name? Or would only certain services with tags be included to avoid spamming? It's pretty easy to aggregate content with a certain tag from both delicious and flickr, such as this "taggregator:"
Change the word "music" in the url to something else to get a different tag. This only gives you the most recent items with this tag however, not necessarily the most relevant. I'm working on an RSS aggregator that uses user-generated tagging (or folksonomies, or whatever you want to call it). It allows for multiple-word tagging, private a public feeds, and even bookmarks. Do you know http://www.taggle.org/ ? Yeah I checked all the taggle. * domains before posting the note. I don't know the person who runs taqgle.org, no. The abuse of (meta)tags is the reason all the large search engines like Google & Yahoo don't considder meta tags anymore when ranking pages. So why would it be different with these tags ? Well, limit who can add tags, perhaps. Only trusted users tagging Flickr photos, for instance. Or use reputation. Keeping the spammers from ruining things ought to be possible one way or another. I certainly would like such a search engine. 2005 is going to be the year of the tag. Isn't this what RDF and the semantic web offer? It seems to me it is, at least as far as tagging your own site goes. But aggregating all the tags that other people apply to your site . . . interesting notion. Do it! It will be an important step toward the goal of karass discovery!